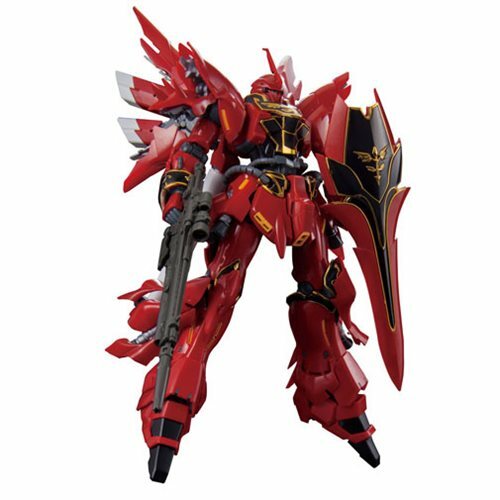 The crimson Mobile Suit Sinanju, piloted by the leader of the Sleeves, Full Frontal, has finally launched in the Real Grade line-up! The model includes movable rear-mounted thrusters, which are based on the thrust control mechanisms of real rocket engines and internal skeletal detailed from drawings by Hajime Katoki. The texture of the brilliant gold engravings have been faithfully recreated as individual parts while the main body is made in a glossy red plastic. Set includes a beam rifle, beam saber, beam axe, shield, beam effect parts, and interchangeable hands. Comes with 15 Runners, Realistic decals, and Instruction manual. Measures approximately 6-inches tall when complete. Ages 15 and up.